We had bought our first moored boat and went to use it after it had been on the mooring for about 6 months. We started the engine and put it in gear but it did not move. The shaft was rotating and I thought the prop had fallen off. I got a diver to check this but the prop was still there but was heavily barnacle encrusted. He scraped the barnacles off the prop but I remained sceptical that this would be effective. I was absolutely astounded that the boat now performed normally! I tried a range of solutions including application of specialised coatings but nothing was effective for more than 6 months. The only solution at that time was to have a diver scrape the prop regularly which was both inconvenient and costly. Cruising North Queensland was a special problem with crocks, stingers and large sharks making diving risky. A better solution was needed. I made up a test piece consisting of stainless bar attached to copper tubing and hung it off my mooring for about 3 months. The photo shows the result. 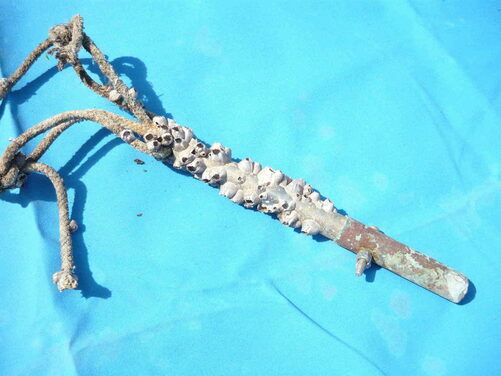 The stainless bar is heavily encrusted with barnacles but there is no sign of barnacles on the copper tube. Some erosion of the copper is evident as anticipated but when cleaned the stainless bar showed no sign of corrosion. As a result, I removed the zinc anode from my aluminium bronze prop at haulout time and anxiously awaited results when the boat was relaunched. I dived on the prop at 3 months and all seemed ok.
At the 12 month mark I slipped the boat and carefully examined the prop. 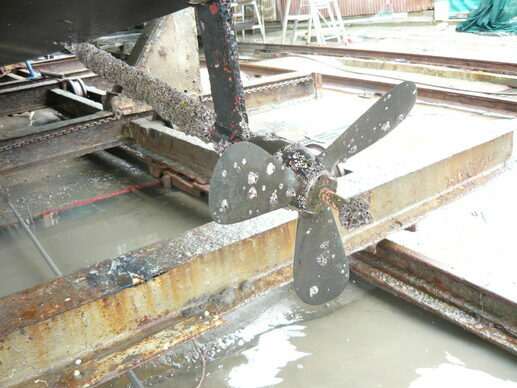 As the photo shows only a few barnacles are attached to the prop blades and these were easily removed. They probably would have been detached if the boat had been used regularly. One casting on the hub of the prop had some minor pitting and reddish marks that suggests some iron inclusion in the alloy used. There was absolutely no sign of pitting on the blades and when the heavy coating of barnacles was removed from the shaft no evidence of pitting could be seen. The hub was subsequently painted and a copper "anode" as added in an attempt to avoid further pitting of the hub casting. Due to unavoidable circumstances the boat remained on its mooring unused for 18 months before being slipped for maintenance (normally conducted annually). The photo below shows the result. 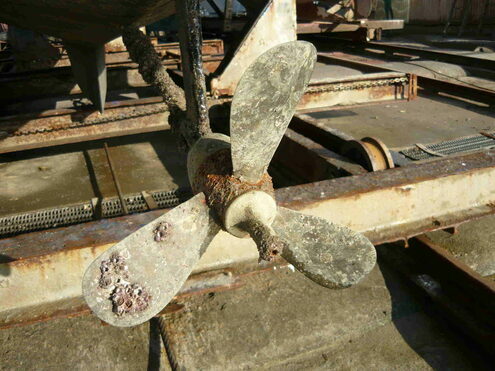 The barnacles on the prop were very easily removed suggesting that they may have been detached if the boat had been regularly used. In contrast the shaft was very heavily encrusted and the barnacles were difficult to remove but once they were removed there was no pitting on the shaft. The copper tube "anode" at the rear of the prop consisted of a number of lengths of different diameter copper tubes concentrically fitted. One or two tubes had eroded completely and the remainders show evidence of corrosion indicating that the "anode"was working. There seemed to be no additional pitting of the prop hub casting. The barnacle encrustation at the outer end of the "anode" has formed on the stainless washer and "anode" retaining nut. The tube "anode" was removed and replaced with a more substantial copper "anode". After nearly 16 Months without any attention, I dived on the prop to inspect it. There were only 3 barnacles on the prop blades and they were easily removed. In contrast the shaft was heavily encrusted with firmly attached barnacles which were removed with some difficulty. There was no indication of corrosion or pitting on either prop or shaft. The copper "anode" had some erosion as expected. Please note that the above information is provided for interest only and is not intended to be regarded as a prescriptive guide for others to follow. Considerable care needs to be exercised when experimenting to avoid unintended erosion of props, shafts and other items such as skin fittings etc. Each boat is different in either design, construction or operation. That said, it is hoped that someone with more knowledge of the subject than I can further develop barnacle resistant props for all.